The bathroom is one of the most important rooms in the house: it’s both where you start your day and where you end your day. Today bathrooms are becoming retreat rooms where you can go to rest and rejuvenate without leaving your home. At the Bathroom Place, we understand remodeling your bathroom can become overwhelming, so we’ve compiled some of our favorite modern bathroom remodeling ideas to help you get started on your bathroom haven. Today your sink can be a work of art. 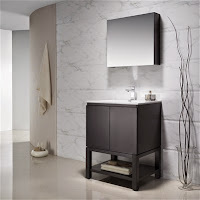 Whether you choose to make your sink or your vanity the focus of your bathroom or you’d just like to find a new modern sink to match your décor, with vanities and sinks from the Bathroom Place, you can find the right style, shape and color sink for you. Heated bathroom mirrors really help turn your traditional bathroom into a luxurious bathroom. Heated mirrors steam up one area of your mirror so you can use the mirror right after you shower, without having to keep wiping fog off with a towel. Ideal for men who like to shave when their hair follicles are still soft or for women who prefer to style their hair or start on their makeup right out of the shower, heated mirrors are one of our favorite trendy bathroom additions. A walk-in shower provides both a modern look and feel to your bathroom. It also gives you extra showering space so you never have to worry about bumping your elbows against the wall or not having enough space to shave your legs. For extra relaxation, consider adding a premium shower head or even multiple shower heads to your new shower! Freestanding and sunken bathtubs also give your bathroom a modern, luxurious feel, as well as the option to add in jets and whirlpool features for the ultimate bathing experience. While pure white standalone tubs are currently the most common freestanding tub style, you can also create a soothing environment with a black or gray tub. Sunken bathtubs take oversized tubs even one step further and help provide you with the ultimate bathroom experience. While not the prettiest feature, toilets are perhaps the most important part of any bathroom. When choosing a new toilet, remember to think about what size and height you prefer, in addition to what style will go in your new room and any extra features you’d enjoy. Bidets are great for improving personal hygiene, and heated toilets add the extra touch of comfort you need to turn your bathroom into a spa room. Remodeling and upgrading your bathroom not only provides you with a new way to relax, but it can also add real value to your home. Whether you know exactly what you want, or you still need to browse toilets, showers, tubs and more bathroom accessories, the Bathroom Place has you covered with a wide variety of high-quality bathroom products. Have a question about updating your bathroom? Contact us today! We’re always happy to help.